April 8, 2019—Dogs are always up for a walk—they may be the ultimate exercise buddies. 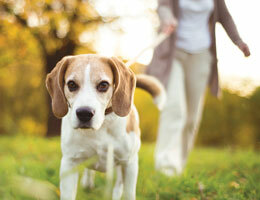 But a new study reveals that for seniors, walking with your furry friend may carry an unexpected risk: broken bones. Researchers found that bone fractures tied to walking leashed dogs in U.S. adults age 65 and over more than doubled in recent years. The number of cases jumped from 1,671 in 2004 to 4,396 in 2017. The researchers attributed that jump to two factors: more pet ownership and an increasing emphasis on exercise later in life. Nearly 80 percent of the fractures occurred in women. For seniors overall, hips were the most commonly broken bones—they made up 17 percent of all the injuries. Next came wrists and upper arms. All those broken hips are especially concerning. The death rate related to hip fractures for people over 65 is close to 30 percent. These findings shouldn't be used to discourage seniors from owning or walking dogs, the researchers said. But older women in particular should be aware of their fracture risk. And all seniors should consider precautions to avoid a nasty injury—for example, obedience training so a dog doesn't lunge while leashed. If you're looking for a dog, consider a smaller breed. The study appeared in JAMA Surgery. Reduce your risk of a dangerous fall with these balance exercises.